SOLANA BEACH — Solana Beach inched one step closer to having a certified Local Coastal Program Land Use Plan, which would give the city more control over development within its borders, but bluff-top homeowners would argue it is partially at their expense. Council members at the April 13 meeting approved a draft public recreation impact fee study that requires bluff-top property owners to compensate the public for beach that is lost by sea walls they build to protect their homes. Environmentalists say the bluff retention devices prevent the natural erosion that creates beaches. The fee, a requirement of the California Coastal Commission, is part of the Local Coastal Program Land Use Plan the city adopted in 2013 after more than a decade of work. It will be determined on a case-by-case scenario and ranges from $431 to $939 per linear foot for sea walls permitted this year. Most bluff retention devices in Solana Beach are about 50 feet long. The price per foot will increase annually. Bluff-top homeowners say the fee is duplicative as they are already paying land lease and sand mitigation fees. They also claim the methodology used to determine the charges is flawed. He said it is cited by the Environmental Protection Agency and National Oceanic and Atmospheric Administration for environmental amenities. He said alternative methodologies are difficult and expensive. Because the numbers are conservative, the study is defensible, said resident Jim Jaffe, an attorney and member of the San Diego chapter of the Surfrider Foundation that worked to create the Land Use Plan. “I’m sure we’re going to hear from the people subject to this fee that it’s still terrible in some respects, but it’s kind of ironic,” Jaffee said. According to the formula used the beach is valued at $2 million to $3 million annually, but a bluff-top home currently for sale is listed at $12 million, he said. “So it’s a pretty good deal for these folks to spend … a few thousand dollars perhaps to protect that investment,” Jaffee added. “And really there’s no loss for them because they’ve got their sea wall. The only loss is the loss of the beach. “That’s the reason we’re assessing these fees because we’re going to lose the beach when you build that sea wall,” he said. “It’s not perfect,” Mayor Dave Zito said of the study. 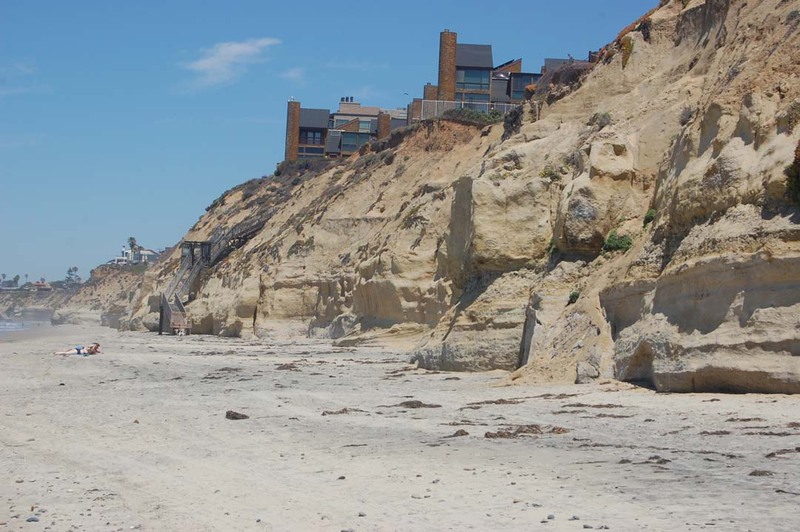 “What is best for Solana Beach residents (is) always a balance between the residents that are on the bluff that are trying to protect their homes and the residents that are in the rest of the city that are trying to enjoy the beach. “As far as the value of that beach, it seems like we are trying,” he added. “Maybe (we’re) not achieving the perfect balance but at least it’s a starting point,” he added. With Peter Zahn absent council voted 3-1, with Ginger Marshall dissenting, to submit the draft to the Coastal Commission for approval. The Coastal Commission will have 90 days to review the document but the agency usually requests extensions of up to a year, City Manager Greg Wade said, adding that it could be shorter because staff has been heavily involved in the process. It will likely be returned to the city with suggested modifications. Council members will have 180 days from that time to review the changes. They cannot pick and choose which modifications, if any, they want to accept. They must approve the document with all of the changes or none of them. If they accept them it will go back to Coastal Commission for final certification, making Solana Beach the last city in the county to have an approved Local Coastal Program Land Use Plan.